The the production 4-seaters were the AA-5 Traveller introduced in 1971, the AA-5A Cheetah and AA-5B Tiger. First introduced in 1972 as the AA-5 Traveler, with 150 horsepower, this four-seater resembled an enlarged AA-1 and also utilised the bonded metal and tubular spar construction of the AA-1. 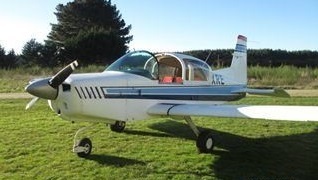 In 1975 Grumman American introduced a major airframe clean-up and the more powerful 180 hp AA-5B Tiger. The Tiger features an enlarged and redesigned tailplane (from the AA-5), fixed pitch prop and undercarriage. The modified airframe was reunited with 150 hp in 1976, and the new AA-5A Cheetah replaced the Traveler. All these airplanes share key features. Entrance is through a sliding canopy, which can be left open during flight. Rear seat backs are removable, and the rest of the rear seat folds flat to form a cavernous cargo area, station-wagon style. All three airplanes have fixed gear and fixed-pitch propellers. And the airframes of the little airplanes are made partially of an aluminum honeycomb material; most of the skins are bonded rather than riveted together. This skin bonding process has had its troubled moments. Problems occurred when Grumman American moved its light-plane manufacturing from the Cleveland, Ohio area to Savannah, Georgia. The new plant's bonding process went through a shakedown period during which, occasionally, an airplane control surface would delaminate. But this never happened suddenly, so there was no safety problem, and the factory made good the airplanes that were affected. Fuel is drawn from one wing or the other, and a pointer, activated by the selector, indicates which fuel gauge to read. Taxiing is with the full-swiveling nose wheel dictating that you guide with the toe-brakes. In addition to their basic clean-up modifications, the Tiger and Cheetah also have horizontal and vertical stabilizers that differ from those on the Traveler. The changes offer more balance and more responsive control and eliminate the need for the Traveler's dorsal fin. The Grummans share a free-castoring nosewheel. Trying to keep the airplane simple, the makers of the Grumman American lightplanes decided to have no steering on the front wheel. Differential braking on the mains swings the nose in the desired direction, and the free-turning nosegear follows. For the 1977 model cabin noise is way down from the 1976 model, thanks to a windshield that's twice as thick and the firewall's being raised and extended to meet the top of the cowl deck; formerly, there had been a crescent-shaped opening that allowed engine noise to pass. The aft skirt of the canopy has a new, redesigned seal, and the forward edge now has two bladder-like seals that meet an opposing rubber strip instead of the bare metal of the windshield bow. Because people had complained about the airplane's tendency to pitch like a rocking horse on rough surfaces, sometimes leading to prop clings, there's a new shock absorber for the nosewheel made up of a pair of oleos at the top of the strut, to absorb fore-and-aft jolts. The rubber seal that covers the attach-point gap at the wing roots has been widened. The propeller spinner bulkhead has been beefed up in response to frequent replacements necessitated by cracking. Fuel-tank sealing has been improved, as has access to the tanks. Primary airspeed indication is in knots. The GA Tiger, announced late in 1974, has the same airframe as the Cheetah nee Traveler, but is powered with the Lycoming O-360-A4K of 180-hp, and sold, new, for $5,000 more than the Cheetah. The Tiger has excellent performance, but we'll deal lightly with it here, because it will be rare in the used market for a while, and priced close to the new ones. The 1976 Tiger's basic price wasUS$24,170, which may easily go above $30,000 fully equipped. By 1975, GA was building 200 Travelers per year, along with an equal number of Grumman American Tigers (the 180-hp model) and, following a move from Cleveland to Savannah, programmed for 500 of their four-placers in 1976. Late in 1975, GA gave the Traveler more stabilizer and flap and rechristened it the “Cheetah”. The 1976 Cheetah's basic price is $19,094. 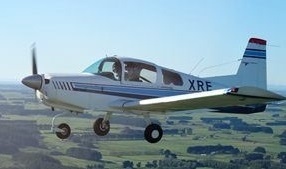 Engine: Lycoming 0-320-E2G, 150 hp. Wingspan: 31 ft 6 in. Wing area: 140 sq. ft. Payload with full optional fuel: 626 lbs. Fuel cap (standard): 38 USG/1228 lbs. Fuel cap (opt): 52 USG/1312 lbs. Stall speed (clean): 54 kts. Stall speed (flaps down): 50 kts. Minimum runway requirement: 1,600 ft.
Cruise (75% @ 8,500 ft.): 128 kt. Economy cruise (55% @ 4,500 ft.): 103 kts. Range @ max cruise (45-min res, std tanks): 461 nm. Range @ max cruise (45-min res, opt tanks): 672 nm. Range @ economy cruise (45-min res, std tanks): 537 nm. Range @ economy cruise (45-min res, opt tanks): 770 nm. Duration @ max cruise (no res, std tanks): 4.4 hrs. Engine: Lycoming 0-360-A4K, 180 hp. Wingspan: 31 ft. 6 in. Payload with full fuel: 668 lbs. Fuel capacity (standard): 51 USG./306 lbs (opt 51 US Gal). Baggage area: 15 cu. ft.
Rate of climb: 850 fpm @ 79 kts. Cruise (75 % @ 8,500 ft): 139 knots. Economy cruise (55 % @ 8,500 ft): 112 knots. Range @ max cruise (45-minute reserve): 512 nm. Range @ economy cruise (45-minute reserve): 567 nm. Duration @ max cruise (no reserve): 4.5 hrs. Stall speed (clean): 56 knots. Stall speed (flaps down): 53 knots. Landing dist 50ft: 1120 ft.
Max canopy open speed: 113 kts.